Sussex County, New Jersey Find a local Easter Egg Hunt in Sussex County, New Jersey! Looking for a local Easter egg hunt for your children? Or an Easter parage, Easter brunch or breakfast or other Easter events in Sussex County, New Jersey? Scroll down this page and you will see all of thoses in Sussex County, New Jersey, sorted by county. ALWAYS either see their website or call before you go to confirm the info, there are often last minute changes which they do not report to us! Hillside Park, 146 Lake Iliff Rd., Andover, NJ. Event date and time: Based on last year's date, it SHOULD be held on Saturday, April 20, 2019 (but be sure to check on their website or call them first as we still (as of April 1, 2019) cannot confirm this year's date and time) at 11 am. 99 Plains Rd, Augusta, NJ 07822. (973) 702-0334. Email: [email protected]. Event date and time: Saturday, April 20, 2019, from 11 am to 1 pm. Join us for our annual Easter Family Fun Day! There will be an easter egg hunt, so be sure to bring your own basket! We will have games, crafts, snacks, and music as well. There might even be an appearance from some furry friends! EvergreEvergreen Park, Green Township, NJ. Phone: 908.852.9333 ext. 13. Event date and time: Sunday, April 14, 2019, at 2 pm SHARP. Easter Egg Hunt is now at the Green Township Fire Department. Kittatinny Regional High School, 77 Halsey Rd, Newton, New Jersey 07860. Event date and time: Saturday, April 13, 2019, from 11 am to 12 pm. Due to the snow, it is not at Valley Patk; instead the Egg Hunt will be at Kittatinny High School in the library. Please bring your own baskets to collect eggs. The groups will be divided into 2 age categories for the egg hunt. 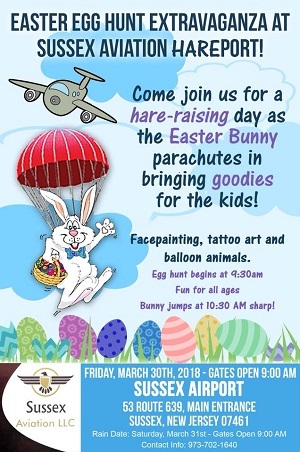 Children will also have a chance to visit with the Easter Bunny, do some spring themed crafts/games and enjoy some refreshments in the cafeteria. Special prize eggs hidden! 68 Sand Hill Road, Sussex, NJ 07461. Phone: 973-827-5251.Event date and time: Sunday, April 14, 2019, at 1 pm. Come on out for Holy Counselor’s 2018 Easter Egg Hunt. There will be games, crafts, face painting and more before we let the kids loose on the front lawn to hunt for their multi-colored treasures. Plenty of fun for the whole family! Modick Park, Hopatcong, NJ. Event date and time: Sunday, April 14, 2019, at 12 pm, Cost: Free. Ages: Newborn to 10 yrs. old. Meet the Easter bunny, hunt for eggs, and have some cookies and juice. Rain/Snow Date a week later. 4 Jefferson Trail, Hopatcong, NJ 07843. Event date and time: Saturday, April 13, 2019, 1 pm to 4 pm. At the Corner of Jefferson Trail & Tulane Trail. Egg hunt, crafts, and hot dog lunch! Egg hunt will be at 2:30. There will be separate hunts for children 3 & under, 4-7 yr old and 8+ years old. Don’t forget your camera to take picture of your little ones and the Easter Bunny. Donations are always appreciated and welcome! 44 Ryerson Avenue, Turf Football Field, Newton, NJ 07860. Phone: 973-383-3521 ext. 228. Email: [email protected].Event date and time: Based on last year's date, it SHOULD be held on Saturday, April 13, 2019 (but be sure to check on their website or call them first as we still (as of April 1, 2019) cannot confirm this year's date and time) at 10 am. Bring your own basket and camera. The event begins at 10:30am. Rain date is Based on previous years' dates, it SHOULD be held on Saturday, April 20, 2019 (but be sure to check on their website or call them first as may have changed, and we have not heard from them); . 53 County Route 639, Wantage, NJ 07461. Phone: 973-702-1640. Event date and time: Friday, April 19, 2019, at 9:30 am. The Easter Bunny will parachute in at 10:30 am. Woodbourne Park, Wantage, NJ. Event date and time: Sunday, April 7, 2019, at 11 am (Rain Dateif needed).